What’s the aim of the eHealth Hub platform? We know that the digital health sector is quite young, evolving and often difficult to navigate. The eHealth Hub Platform is an online tool that maps the digital health ecosystem providing valuable information about its different stakeholders in order to encourage interaction among them. Those stakeholders are: SMEs, investors, experts (e.g. legal, regulatory, reimbursement experts), business supporters, healthcare organisations, corporates (e.g. 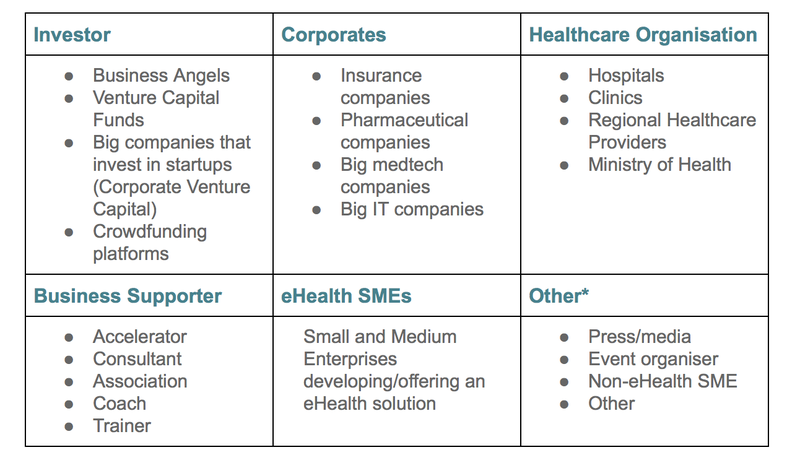 insurers, medtech companies, pharmaceutical companies) and research. However, the main characteristic of the platform is that the SME is at the centre of the ecosystem i.e. the rest of stakeholders must state which are their initiatives and opportunities for collaboration in relation with SMEs (e.g. implement a digital health solution, offer targeted regulatory services to eHealth SMEs, funding). The eHealth Hub team, a new EU-funded initiative focused on the digital health sector. The project is coordinated by TICBioMed, and the team is made up by other awesome partners. Find out more about us and what we do. Take the advantage from a growing business intelligence tool. You’ll be able to follow startups, investors, pharmaceutical companies, healthcare organisations and many more! No, you don’t. The eHealth Hub project has received funding from the European Union’s Horizon 2020 Research and Innovation Programme under Grant Agreement No 727683. The services we deliver are for free during the project lifetime by the partners, who manage it under their best criteria. Do you supervise sign ups? Yes. When you sign in, our curators will review your profile, to make sure that you are a real person. What type of user should I choose when signing up? Just choose whatever defines you best but considering the role you want to have in the platform. Don’t worry if you have different hats, anyway once you are logged in, you can create as many organisations as you please, each of them having a different type. *If you are an expert in legal, regulatory or reimbursement advice and want to be part of the platform, you must register as a node. Our partners will contact you and assess whether you are a suitable candidate. I have chosen the wrong type of user. How can I change it? I created two profiles and I want to delete one of them, how can I do it? That’s great! Go to your organisation, edit profile and add a new member. They will get an email from the eHealth platform inviting them to take part. How can I join an organisation? If your organisation is already in the platform you can become a member. If the profile was created by eHealth Hub, you can claim the profile to update it and invite your colleagues. If the profile has been already claimed, you can request the owners to become a member. They will get an email with your petition. If I get in touch you, when will you answer? We will try our best to answer you in the next 24 hours during weekdays. Do I benefit if I contact an Expert through you? Yes! We know that legal stuff can be tough for companies but we will assist you in the process. Our legal and regulatory partners will evaluate your request, identify your needs and assess whether the expert is suitable for you. They will also make recommendations about what you need to work on and suggest other experts that might be helpful. The idea is to make it easy.